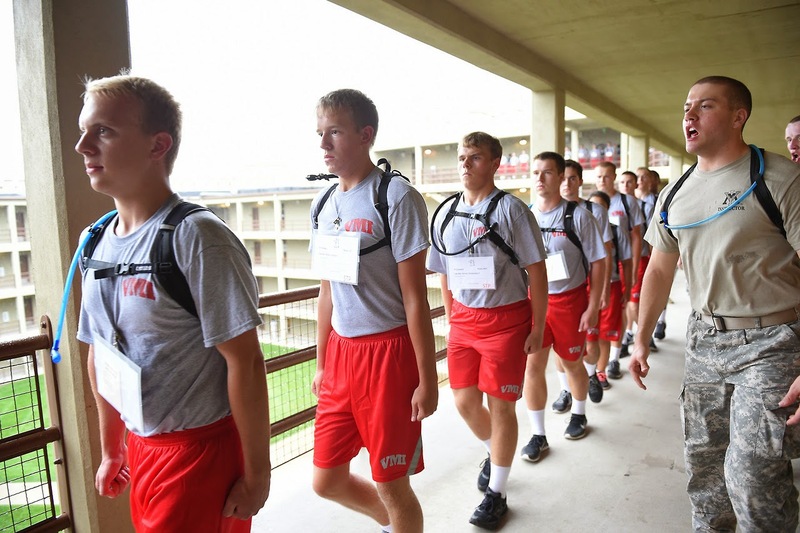 One week ago today we sent Zach off on his new voyage into the world of VMI. One week ago today, he gave me a wink and a smile as he marched off to begin Hell Week as a RAT. What the hell kind of mom wants her kid to be a rat? I must be crazy! As his crazy mom, my heart swelled with pride, at the same exact time it sank, when his wink and smile hit me. I knew exactly what he was headed into. I knew, without a doubt, it was going to be a week from Hell, with Zach being pushed beyond his limits physically, mentally and emotionally. And I willingly let him go. I willingly let him march into a barren set of barracks, which Lucas likened to a prison, knowing those big iron gates were going to be locked shut with my son inside waiting to be screamed at with 500 of his closest friends. Was I crazy? I don’t think I am. Ok, so maybe I’m a little crazy. But on this one thing, for my oldest child, I don’t think I am. It never bothered me, really, to think about him being yelled at for his clothes being wrinkled, or standing the wrong way, or not having shiny enough shoes. It never really bothered me to know that he’s going to be road marching, carrying a rifle, learning to shoot and rappelling down cliff sides. What did bother me, was saying, “Good-bye, see you soon, I love you, I’m proud of you,” and watching him go. But I knew he was going to be more than OK.
Zach is the fourth one back. In the days after he left, I’ve had the opportunity to find pictures of Zach online. Parents of older kids post them. Photographers post them. 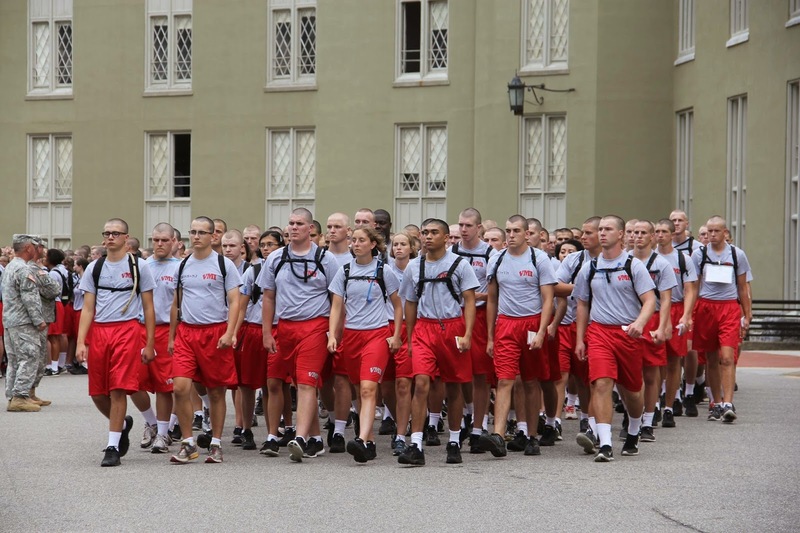 VMI has webcams and videos for all of us to watch. Not to get involved, just to watch from the sidelines. I couldn’t be more grateful to all of them for letting me have a little glimpse of life for Zach. The first ones I found were of him on Sunday morning. He doesn’t look sad or scared or mad. He looks determined. Those pictures tell his story. Zach is on the far right in the front. Zach called on Wednesday. And it was the sweetest five minutes I’ve had in a long time. I got to listen to him to talk. Just listen. He wanted to tell me everything. He told me he’s surviving. He told me it’s the hardest thing he’s ever done. He told me he’s “strangely happy.” On Wednesday I figured I must be crazy because all of those sentences were music to my ears. As Zach wound down it what he wanted to tell me, I got a chance to tell him a couple of things. Of course, I told him I was proud of him. But I also told him this is what he’s always searched for ~ someone who pushed him and pushed him and pushed him. He looked for challenge in all of his coaches. He looked for the challenge from all of his teachers. He looked for the challenge in us. I told him that now he has the challenge in every single facet of his life. I also told him about the pictures I’ve found. The determination in his face is evident in every picture I see. I told him I see it. It’s there. He knows it’s there. He put it there. It’s there because he is determined to not fail, to not give up, to live up to the challenges he’s facing. So am I crazy for sending my oldest off into this crazy world of mind games and pushing the physical limits of not only him, but every kid who walks through those gates? I don’t think so. I think Zach is right where he belongs. I couldn’t be more relieved, for him, for me and for his 500 Brother Rats, who will become his closest friends, and who chose to walk this same path.